Gael’s Intro: Hey guys, as part of my goals of 2016, I said I wanted to make Authority Hacker less about just Mark and I and more about the community of people who actually do what we do (building authority sites) and are successful at it. Don’t worry, I will be back on the blog writing long analysis and how to posts very soon​ but today we have someone that I highly respect. 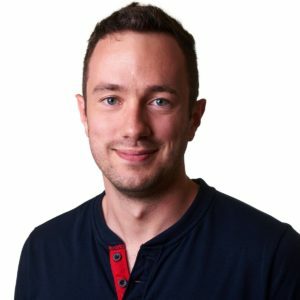 Jon is a guy who first makes money from his sites (outside the make money online niche) then writes about it unlike many people in this industry. In fact, he made over a million dollar from display ads and over $400,000 profit from it last year outside the online marketing niche. I am also very interested in Jon’s case because he makes money slightly differently than us. Most of his income comes from display ads (Adsense, Media.net etc) while most of ours comes from email. I have been studying him greatly and tested some of the ad layouts he shares in this post and we are already seeing a 40% increase in ad earnings while email earnings remain just as strong. This post is not a step by step tactic or anything specific but rather nuggets Jon learned building a $1 million /year authority site empire. If that is something you are after, pay close attention and experiment with things he mentions. I remember the day when I knew, without a doubt, being a website publisher was the career and business for me. I was reading some article which happened to mention the then foreign-to-me concept of affiliate marketing. It explained how Amazon paid website owners a percentage of sales generated simply by linking to Amazon from a site they owned. I immediately realized the potential this had. Up until that point, I managed a website for my local business. The site performed well and attracted plenty of new customers, so I knew a little about blogging and publishing websites. Ironically, at that point, I had no interest in display ads for monetizing a site. I’d only read that huge media publications were having a hard time making ends meet with banner ads. I naively concluded monetizing a site with display ads was a bad business model. Fast forward through several years of affiliate marketing (which I still do), and now my largest revenue source is display ads… and I love it more than I ever did when focusing solely on affiliate offers. 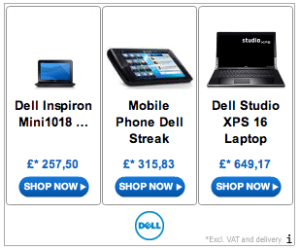 Why do I love monetizing with display ads? My one-word answer is flexibility. With on-site affiliate marketing, content is geared toward promoting products. Frankly, publishing content solely geared toward product promotion in some fashion gets boring. It’s also restrictive. Monetizing with display ads means you can monetize almost any content. I love that. I listened to the wrong people. For years I resisted display ads because I kept reading that Adsense doesn’t generate any money worth talking about. Well, this is true if you only publish websites about internet marketing. I agree: Adsense is not optimal for these types of sites. I don’t use Adsense (much) on Fat Stacks Entrepreneur. However, in many other niches, which are a ton of fun and have massive potential, Adsense and other ad networks can be a goldmine. Jon's Adsense Earnings in 30 days. Read his 2015 earning report here. I discovered this when I paid a guy $250 (or $400 I can’t remember) for a 1 hour skype session several years back. He showed me his Adsense revenue and how he generated it. It was so simple. I loved the concept. I went at it hammer and tongs and haven’t looked back. I agree: making $3.00 per day from display ads isn’t fun. However, making $300 per day from display ads is thrilling. I love it. Great content + plenty of quality traffic + optimal ad placement = display ad revenue. Gael: How long did it take you to get there? Jon: How long? I suppose it took about six months with my first social media niche. That was when organic Facebook traffic was still great. I invested in fan acquisition and then sent traffic to my site from the Facebook page. With my current largest niche site (2 years old), it took 3-4 months to get to $300 per day, but that was a result of paid traffic. As for $300 per day from organic search traffic, that took about 15 months. There’s a trend right now I’ve dabbled in, where website owners create thin clickbait content formatted in extremely paginated posts and buy traffic—with the goal of earning more in display ads than they pay for the traffic. This is loosely referred to as ad arbitrage. It works. I’ve done it. Some publishers make a killing doing it. However, let’s face it: the content isn’t great (although there are exceptions). Yes, this business model works for now (it’s up and down). Yes, you can make a pile of money. Here are the problems I have with it: it’s not very passive, and the long-term viability is questionable. It’s not passive because you must constantly manage ad campaigns. The margins are usually thin so every campaign driving traffic must be optimized. Ad management can consume 4 to 10 hours per day. The long term viability is questionable because from what I understand, quality paid traffic sources are losing interest in extreme pagination. Display ad networks may eventually tire of these sites too. Moreover, it’s volatile because traffic prices and ad RPM fluctuates. It’s a juggling act. I’m NOT suggesting buying traffic is bad here; instead I’m suggesting building your entire niche business on thin, extremely paginated content has its own set of problems. I think there’s a better way to proceed. Gael: What’s hard about managing campaigns and buying traffic? Would you recommend it? Can you still do it now as CPCs are increasing? Jon: Buying massive traffic requires constant review and management. Most new campaigns don’t work. Those must be stopped, and new ones must be created and tested. It’s an ongoing process. Over time, the goal is to have a stable of 10 to 100 profitable campaigns–but even then, the ongoing management is labor-intensive. There are many variables with paid traffic; the two biggest are the cost of traffic and revenue fluctuations. Both factors fluctuate daily, so it requires ongoing management to ensure profits. There will be times when paid traffic doesn’t work, which can be very frustrating if you come to depend on it as a primary traffic source. This is why, despite paid traffic being potentially very beneficial, it’s good to develop additional traffic sources. Profits & exposure. When done right, buying lots of traffic can lead to fast, scalable profits as well as great brand exposure. Fast social media channel growth. This is huge. With Facebook ads, even if you optimize the ads for “clicks to website,” you’ll get new fans very quickly, which in turn is another source of free traffic. The website traffic can help build other social media channels, such as Pinterest, YouTube, etc. Social media proof. A lot of traffic can generate a lot of social shares on specific posts. When you set the social media buttons to display share count, and there’s 10,000 shares, that’s strong social proof for that post )and the website). Email subscribers. If you run an email newsletter, paid traffic can build up your subscribership very quickly. Imagine breaking even with paid traffic and getting subscribers for free. 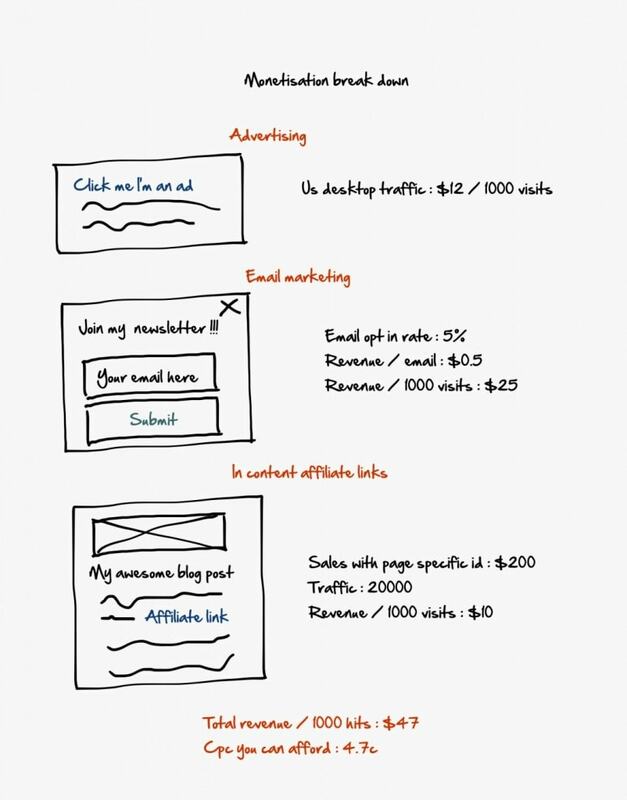 If the email newsletter is decently monetized, that can be a very good business model. I do recommend using paid traffic, especially for younger sites, if you can make it work. Younger sites have no authority, so organic search traffic will be low. If you want results fast, paid can deliver. I still run paid traffic to some of my sites and probably always will, but now it’s less of a focus because I’ve developed several excellent traffic sources. Let’s first ask a question. What does it mean to publish great content in this case? Great content is publishing content that will rank in the search engines long-term. 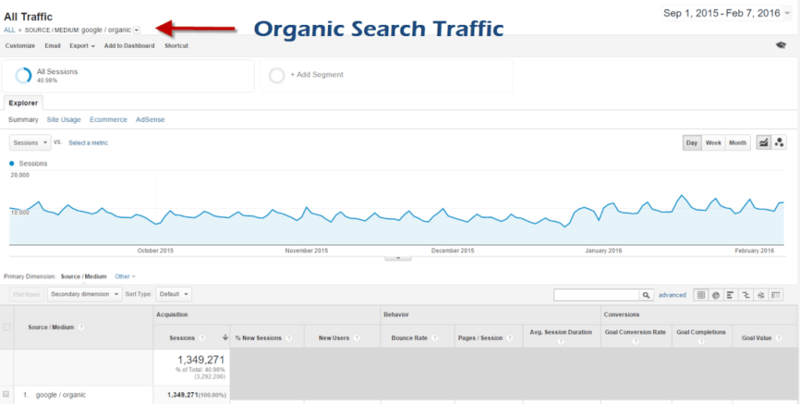 While I certainly don’t suggest relying 100% on organic search traffic (we know how fickle that can be), I do suggest that you publish content that has a good chance of pulling organic search traffic in the long run. Even if it’s long tail keywords only, that’s fine. 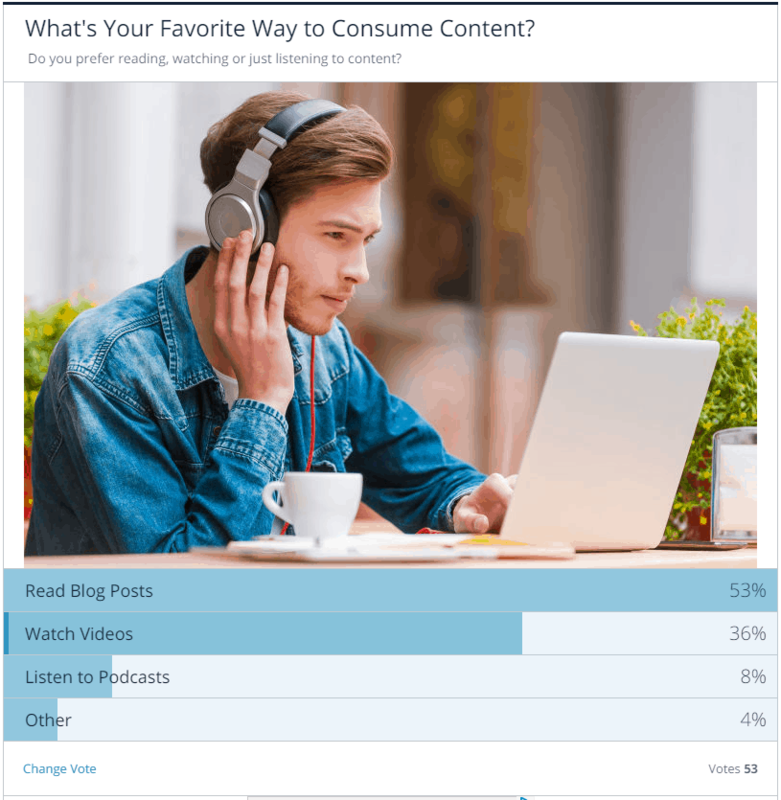 If you publish a lot of great content, the traffic from long tail adds up. For example, my biggest site pulls gets 12,000 to 19,000 daily organic search pageviews from literally thousands of keywords. Some keywords pull in a lot of traffic each day, but overall, the lion’s share of traffic is from the long tail. This site has a little over 1,000 published posts. That means, on average, each post pulls in 12 to 19 daily pageviews which isn’t much per post… but it’s a lot if you have a lot of posts. I’m not going to expand on what great content is. Most people know what it is. It doesn’t have to be the best on the planet, but it must be good. It must offer value to visitors. It must be unique. Word count isn’t the be-all-end-all, but generally, my posts are 750 words or longer (some over 5,000 words). Again, don’t live and die by word count; however, publishing 2,000 posts, each with 100 words, won’t pull in a lot of long tail organic search traffic. For my big sites (I have 3 large B2C sites earning 100K visits/mo or more), I attract traffic from many sources, including organic search, social media, YouTube, curation sites like StumbleUpon, direct from other sites and paid sources (Facebook ads and native ads). I’m not dependent on one source. Each source takes time to build up. 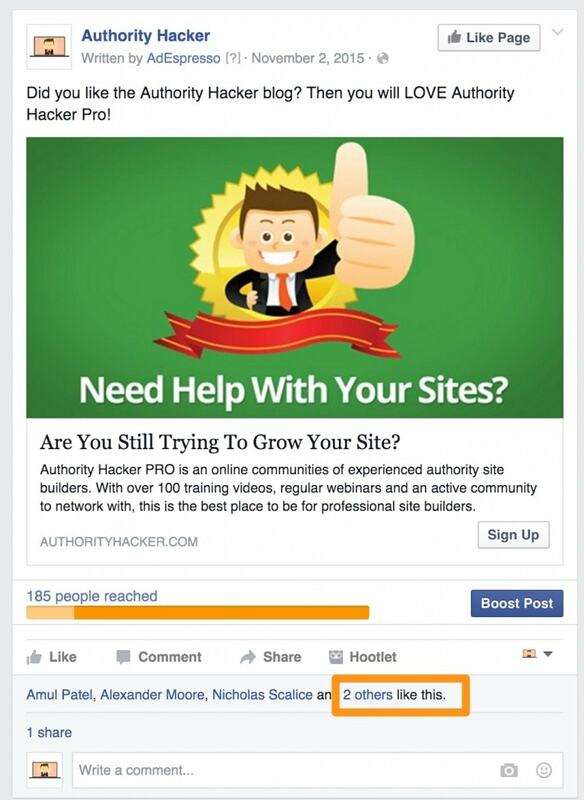 You need Facebook fans for organic Facebook traffic. You need site authority and decent SEO for organic search traffic. You need a well monetized site in order to buy traffic. All of this takes time, but with effort it can work. There are 3 ways I’ve been able to turbo boost traffic to new sites. I’m talking 100K plus monthly pageviews. Here are the strategies I use to get to 100,000 monthly visitors. Gael: How long does it take you to get to 100,000 visitors per month? Jon: It totally depends on the traffic strategy. If you buy traffic, it can take a few weeks or less. If you count solely on organic search and/or organic social media, it can take 6 to 24 months, depending on many factors. I believe I got to 100,000 monthly visits from organic search in 9 months. If you can break even or profit from buying traffic, do it. I did this with one site and took it to nearly 2 million monthly page views inside of one year. This traffic catapulted the site and now has its own momentum with social media and organic. I don’t buy nearly as much traffic anymore because it has its own momentum, which it never would have achieved without buying traffic. Gael: How do you buy traffic and break even on a site that just offers content? 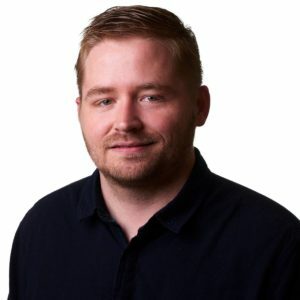 Jon: The first step is to ensure your site is well monetized–whether with ads, affiliate promotions and/or an email newsletter. Once you know your revenue per thousand visitors (RPM) on desktop and mobile, you know how much you can spend per visitor. I’ve tested thousands of ads. It’s time-consuming. Most don’t work. 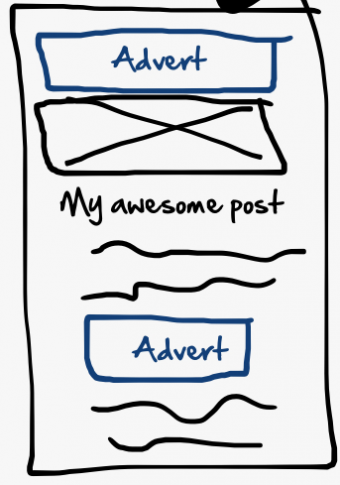 The key is testing all of Facebook’s ad formats on all devices. It’s also worth trying native ad networks such as Taboola and Outbrain. I’ve also used Bing Ads effectively, although the volume was never as high as I’d like. Here is the kind of analysis you want to run before getting into PPC. Then it's easy to max your CPC to your max value and make sure you don't lose. Facebook fan acquisition was most popular around 2011-2013. The concept is to invest in attracting Facebook fans to a Facebook page; then, send fans to your website via Facebook Newsfeed posts. This worked spectacularly well a few years ago, but it still works. In fact, I recently got involved in a website that is doing this and the organic Facebook traffic is amazing. The key here is engagement. I don’t think this strategy works in every niche, but if it works in your niche, it’s a viable strategy. As an aside, if you choose to use Facebook ads to drive traffic directly to your site, you will still get a lot of new fans because people who interact with Facebook ads, even if optimized for “clicks to website” will become fans. This is my preferred approach; however, I can’t deny that focus on fan acquisition still works. When you run Facebook ads, you can actually get a LOT more Facebook fans with a simple trick that very few people know about. 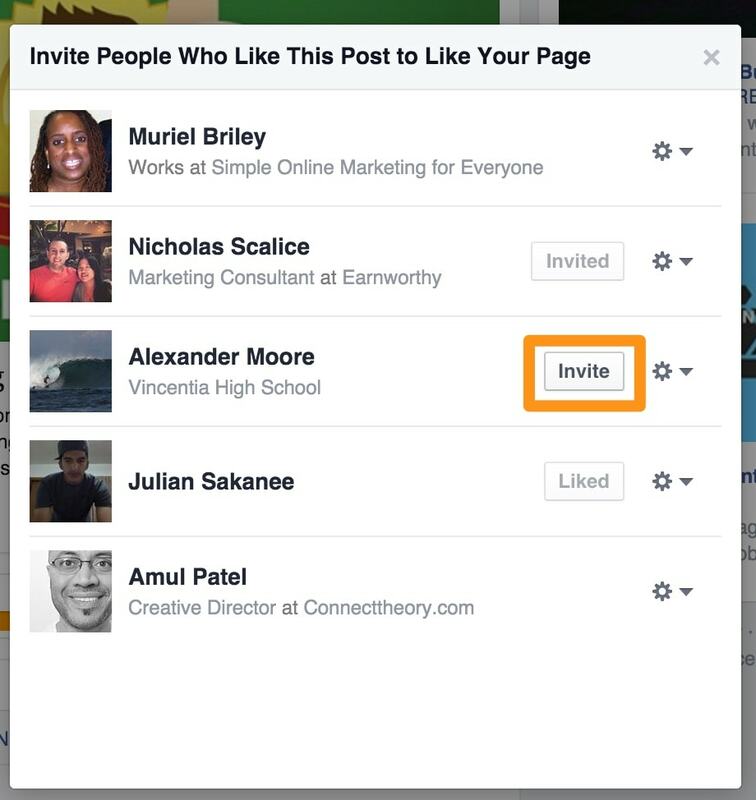 You can actually invite people to join your Facebook page which is essentially free page like ads if people liked a post of yours. Voila, free Facebook fans from any kind of advertising you are running ;). I recently bought a website with 130,000 to 170,000 monthly pageviews. It’s established and the organic search traffic is established. Surprisingly, it didn’t cost too much. It’s 8 years old with decent DA and is ready to grow. There’s a learning curve when buying an established site, but the potential is huge. Buying the site saved me years of work and thousands of dollars in content. I love this strategy, but beware: buying websites is a whole different ballgame. It can be very rewarding (and profitable), but it can also be both difficult and risky. I’ve been a part of successful site purchases, successful sales… and even a couple flops, so I wanted to drop in my two cents here. First, Jon is a monetization expert. Not everyone is (I’m certainly not), so buying a website for traffic only may not be as profitable without that skillset. Instead, if you’re looking to get into the site-buying game, you should probably focus on ROI and opportunities that play to you strengths. George from WiredInvesters (a group who buys and sells digital properties regularly), often says you should play to your strengths and buy sites with obvious opportunities for you to grow it with with skills you already have (e.g. if your primary skill is keyword research, look for high-authority sites with lots of untapped keyword opportunities). Or, buy sites that can add value to assets you already own. Matt Paulson, of MattPaulson.com, crushes it with this strategy. 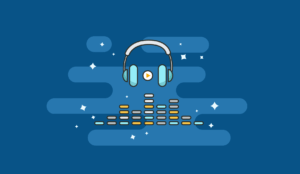 He revealed on a podcast episode from NichePursuits that he buys highly related web properties and simply signs that traffic up to his existing email list using an already-optimized opt-in popup and autoresponder, where he then upsells them on a premium newsletter. Finally, remember that buying sites requires capital, and it’s very easy to get burned. You must, must, must do rigorous due diligence. And, if you’re new, it’s typically best to stay away from places like Flippa; you might be able to find great some deals, but it’s also filled with spammers. Instead, try a marketplace that vets sites manually, like EmpireFlippers (just stay away from anything built with a PBN) or Latonas (one of many emerging high-end website brokerages). A few years ago I ignored SEO. After Penguin, I was done with it. That was too extreme. My problem with Penguin is I relied too much on SEO traffic. But ignoring SEO completely is short-sighted. There’s a middle ground, which is my approach these days. I’m not out to game search engines. I don’t live and die with search rankings. However, I do publish content (a lot of it) with the intention of pulling in long-term organic search traffic. Even though I buy traffic and pull in quite a bit of social traffic, nothing is as passive as organic search. Also, my understanding is that organic search traffic is the most valuable traffic source when selling a site (assuming the organic search traffic is stable or in long-term upward trajectory). This involves keyword research for a series of posts (usually 5 to 30 posts). I structure it as a cohesive group that I will interlink. I include clickbait style posts to drive mass traffic to it (traffic is always good, even if it’s paid). For each post I do the usual meta title and description. I interlink the posts and have clear navigation. I post each post to all social media channels. Where it makes sense, I turn posts into videos and upload those videos to YouTube. To date, I’ve done very little proactive backlinking; however, recently I’ve started some white-hat outreach link-building methods. I’ve had some success, but it is time consuming. It will take time to see if this works well. I believe it will work well which is why I’ve invested in the software and outsourcing to do it. Sites that link to similar resources in my niche – where my content is as good or better. These methods are nothing new. Brian Dean writes about them extensively. I’m not going nuts with this. I’m proceeding slowly to see how it goes. The fact is 2 of my 3 B2C sites are fairly well established (8 years old and 2 years old each with a lot of content) so they’re ready for some additional links (white-hat only via outreach). I don’t go nuts with link building either. You need links, of course, and the more links you have, the better your site will probably do. 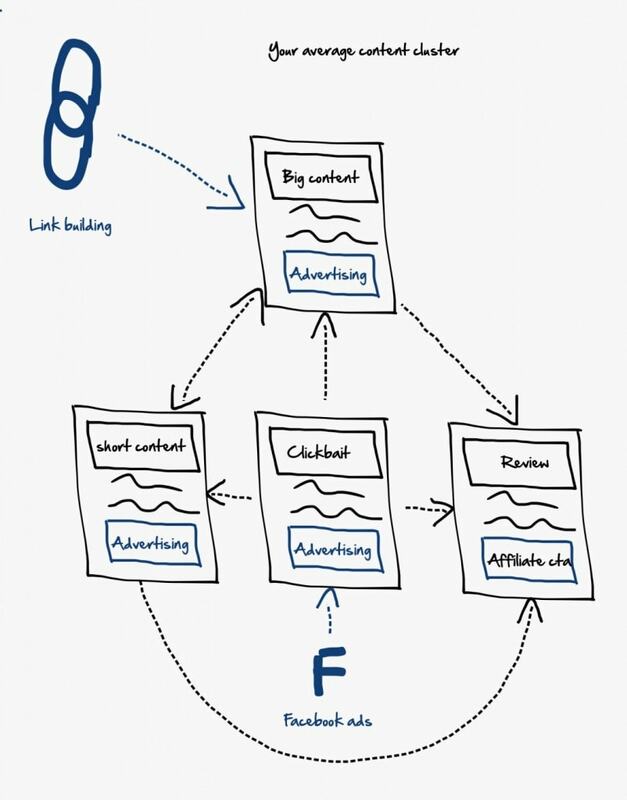 But in the first year or so of a site, the resources you need to really scale link building just aren’t there, and there are so many other things that need my attention. Instead, I like to execute a couple really rigorous link building campaigns when I launch a site, usually after my first batch of content. With my current site, I spent the first two months getting as many articles up as possible. Then, I spent the next two months building links, ending up with roughly 60 linking root domains. That was more than enough to get the site rolling, and it’s grown to 100,000+ organic visitors and roughly $4,000 per month in revenue–almost entirely from that first “round” of links. As the site makes more money, I’ll probably hire someone. However, that initial burst of links launched the site just fine, and for the past eight months, I’ve spent hardly any time building links at all. If Pinterest works for your niche, be sure to activate rich pins. 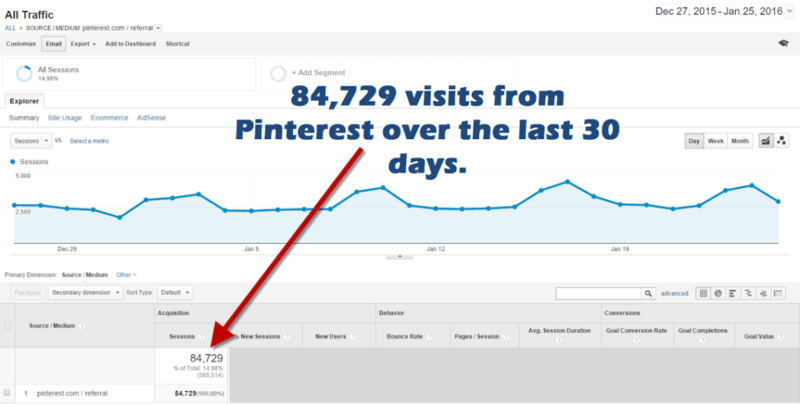 I went from 500 daily visitors to 3,000 plus daily visitors from Pinterest after doing this (it took about 2 months for this increase to materialize). If you have a lot of images that are shared on Pinterest, use the Image Sharer plugin. It’s the best image hover plugin I’ve used and it can drive a lot of traffic. While I post to many social media channels, I focus on 3 (Facebook, Pinterest and Tumblr). These are the platforms that work best for my B2C sites. In the beginning, I focused solely on Facebook because it worked quickly. Once I could outsource that work, I focused more and more on other sources that were working. Interestingly, now Pinterest drives more traffic than Facebook for one of my B2C sites. Just because it increases RPM does not mean you should do it. Be sure you know the terms of service of every ad network you use, particularly AdSense. Just because another site does it doesn’t mean you should. Do consider user experience. At some point people will not go to your site ever because it’s just too annoying. Endless fly-ins, popups, interstitials, etc. can ruin user experience. By all means, be somewhat aggressive, but within reason. For example, I often skip Forbes.com in the SERPs because that interstitial that blocks access to the site is too annoying for me. I’m sure I’m not the only person who thinks so. That said, I’m sure that interstitial ad earns a fortune. Here’s my current ad placements for long content. Adsense leaderboard above post title. The remaining Adsense I put in the middle of content or bottom of content. It’s not a big earner. Disclaimer: The above is what I do on one B2C site. It works for me. I can’t guarantee it’s optimal for your site. I simply set it out as an example. 1. Opinion Stage Polls with ads: I have 2 polls (and/or quizzes) on each page. I run only Criteo, Outbrain and Video ads on these. I don’t have Adsense because I already have 3 Adsense ads on the page. 2. Criteo: Criteo is a backfill ad network. You set a floor CPM and they will trigger if there’s demand. The beauty with Criteo is you’re guaranteed the floor CPM based on impressions, not clicks. However, if you set too high of a floor CPM, Criteo ads will never display. I set the floor CPMs about $.50 higher than the RPM of the other ad units on my page. Here's an example of a Criteo ad. 3. Google Matched Units: This is Google’s related content units. You can choose to include ads. I do include ads. These work reasonably well at the bottom of content. I have one unit on the page. Example of a Google matched unit ad. 4. GumGum In-Image Ads: Because I have quite a few images on one of my B2C sites, I use GumGum in-image ads which shows ads on a couple images per page. This is excellent incremental income. 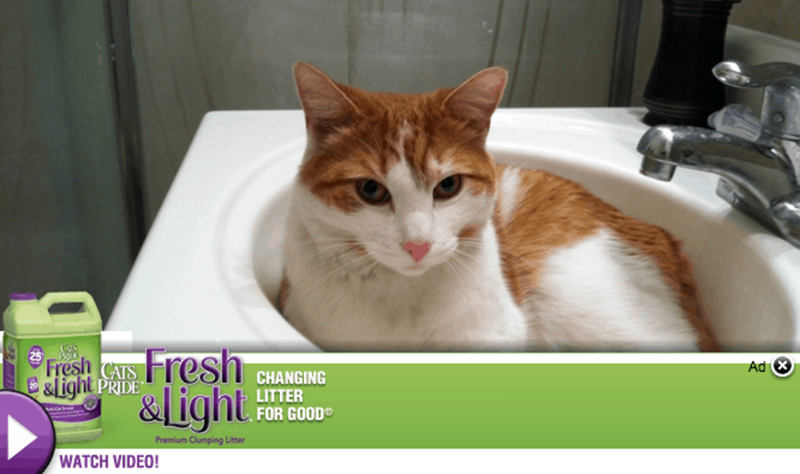 Tip – ask your rep to ensure ads don’t show up on every image. That’s annoying. I set it to show up on 1 to 3 images per page only. Example of a GumGum in-image ad. 1. Video ads: I only use these in my polls and quizzes; however, video ad networks pay well. They’re definitely worth exploring. My problem is I’m not a big fan of them as a user so I tend to not use the much. 2. Exit intent ads: Like exit intent sign up forms, you can use exit-intent ads. 3. Native ads: I’ve used Taboola and Content.ad ads before; however, they don’t pay too well (for my niches). I prefer using that space to encourage clicks to other pages on my sites. That said, I definitely recommend you give them a try. Many publishers use them because they are lucrative. Example of a native ad. 4. Mobile download ad networks: There are many of these. They work in select niches so be sure to inquire whether your niche/audience is a good fit. If your audience is a good fit, this can be a great way to monetize mobile traffic. I admit that launching and building a huge B2C site is a juggling act. There are many moving pieces. You often feel like there aren’t enough hours in the day. One way to alleviate this is once you have some meaningful revenue, start putting together a team. Training takes time, but I can tell you there’s no way I could manage all my sites to the level they run now if I didn’t have my team in place. In fact, I couldn’t handle one of my sites on my own. What’s the first thing you should outsource? The first piece of the puzzle I outsourced was content generation. This is easy to do for most B2C sites. Once you have a content rhythm, simply train a writer or writers to do what you do. It’s best to hire quality writers even if it means fewer published posts per month. Remember you want to publish great content. Once you no longer have to generate content, you’re free to buy traffic, do social media, test ad placement, test new ad networks, create videos, etc. As your revenue grows, hand off more and more to other people. For example, Jon uses Ezoic to outsource some of his ad optimization to Ezoic. They managed to double his earnings for a small % of his ad revenue. The goal is that you need only spend 2 to 10 hours per week on a website. That way you can launch more or buy more or both. Usually “niche selection” is placed in the beginning because it all starts with choosing a niche, but I put it at the end because at the end of the day, most broad niches can be turned into money makers. It may not follow my formula exactly, but if there are existing authority sites in the space, you can be sure there’s money to be made. Each niche will function differently. I’m in 4 very different B2C niches. Monetization is different across the board. I’m still trying to optimize monetization for 2 of the sites. I’m confident I’ll figure it out because there are massive sites in the space, so I’m confident there’s money to be made. Generally, I like niches that have a chance to do well on social media. This includes a lot of niches. I also like niches that are fairly broad so that the potential traffic is massive. I don’t want to do all this work only to be capped at 700,000 monthly visitors. I want to know that in time I can get 3 million monthly visitors (or more). Finally, with regard to domain name selection (I get this question a lot), choose something you can brand. Don’t choose something because your main keyword is in it. You want to brand your site in the long run. 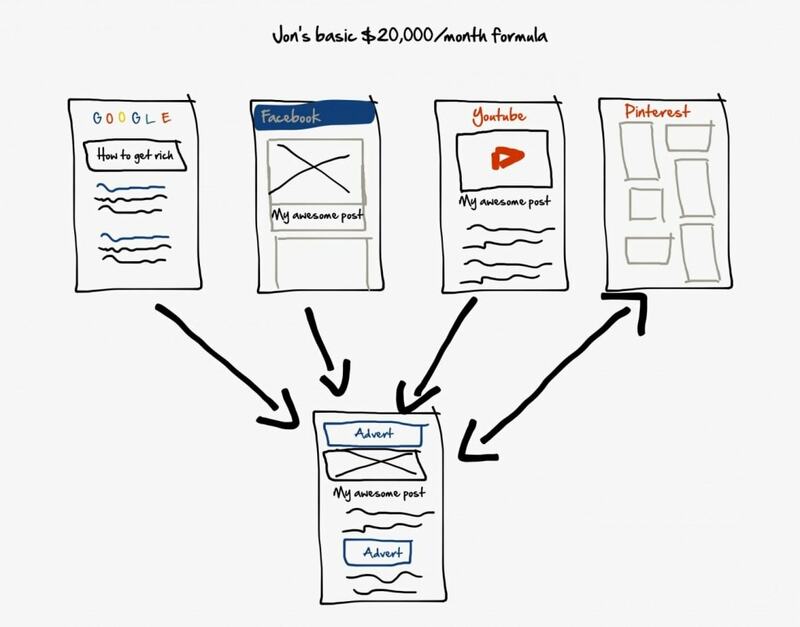 There you have it, Jon’s blueprint to $1 million+ / year revenue with content sites and display ads. I love his systematic approach to things and admire the fact that he was able to scale up to millions of visits monthly on his own. 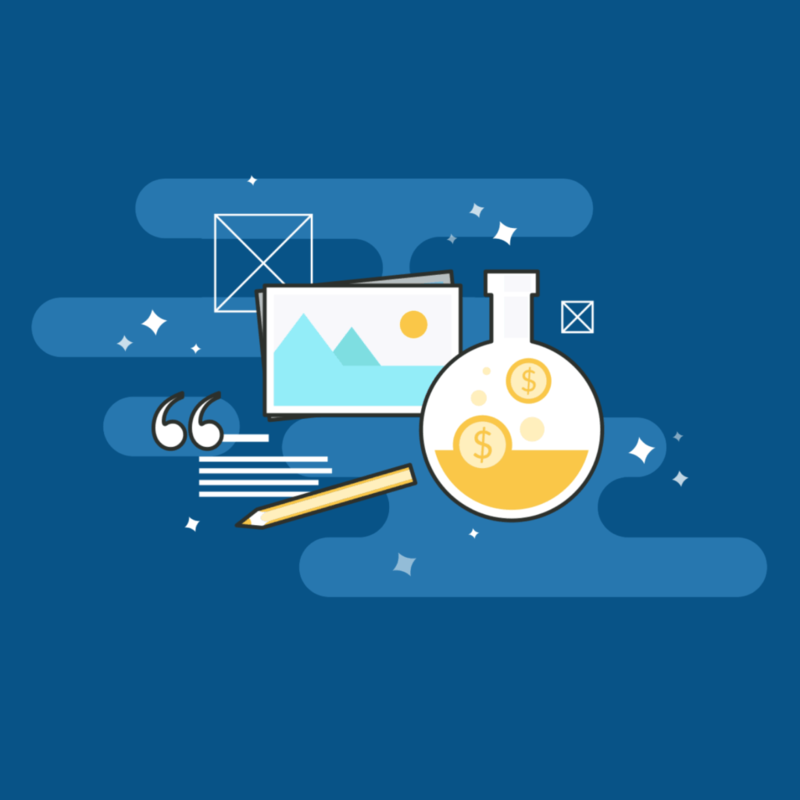 His model is clearly a great complement to our email marketing based model and after reading this post (submitted around 1 month ago) I have started testing Ezoic and a few other ad systems Jon uses​ and almost doubled our display ad revenue. Use his layout, use the systems he recommends and you are in for a treat if you have some existing traffic. Jon is the main guy behind Fat Stacks Blog. He is an independent publisher making over $1 Million / year from display advertising. He occasionally shared his thoughts and learnings on Authority Hacker. Really glad I read this article (Only noticed it was published a long time ago after reading). I find the tips very helpful as I’m working on launching a few viral sites soon. However, with all the recent facebook algorithm updates, it’s not gonna be easy pulling off wonders with Facebook like you did. And for AdSense monetization, I realized a long time ago it’s the best place to start for new bloggers. Thanks for Sharing such an amazing blog post. If the world was so sincere with their articles, then we would have been seeing fewer blogging mistakes and more monetization. 1- On a viral niche, how much money do you make per 1000 visitors? How much money will you have to spend to bring traffic (1000 visitors) from facebook either through FB ads or influencer marketing? I want to know average profit. 2- How can we get traffic from celebrities pages (influencer marketing) and what should be minimum budget? 2- Which platform is the cheapest to bring targetted traffic to viral niche. 2- Your top 3 favorite CPM & CPC networks for the viral niche. 3- Are you using header bidding? What is the best way to increase revenue without destroying user experience? Gael Breton, I want to give you a suggestion to write a post about Buzzfeed. What are their traffic sources? How are they getting traffic from them and how can we do the same? I recently came to know that they are getting enormous traffic from snapchat but I have no idea how are they doing that. I am hoping that when my comment is replied, I will get the notification through email. Thanks again! I’ll ping Jon re your questions, as for the Buzzfeed analysis tbh I think they’re too big to emulate at this point. I’d rather look into sites that are closer to the sites you’d have a chance to build. I hear so many good recommendations about your course i.e. Niche Tycoon, so I’ll have to purchase it soon. BTW, what an Epic blog post here! … Full of valuable information to help new blogger like me. Will also visit our blog for more contents. Excellent article. I am averaging $150-$200 a day with adsense but had no idea that you can put media.net ads on the same page as Adsense. I will be incorporating this into my sites this week. Awesome Brian, let us know how it goes! Wow. This is a very media-buying/selling way of running a website Just checked the fatstacksblog a while ago, and it seems that most (if not all) are gone, does that mean that the email/affiliate marketing approach is much better when a blog has gained sufficient traffic to stand on its own? Honestly, I am highly doubtful that John is able to make the money he says he makes with Adsense. I have a website with 250k PV a month, tried different kind of Facebook ads targeted to my site and the numbers just don’t match for that kind of arbitrage. 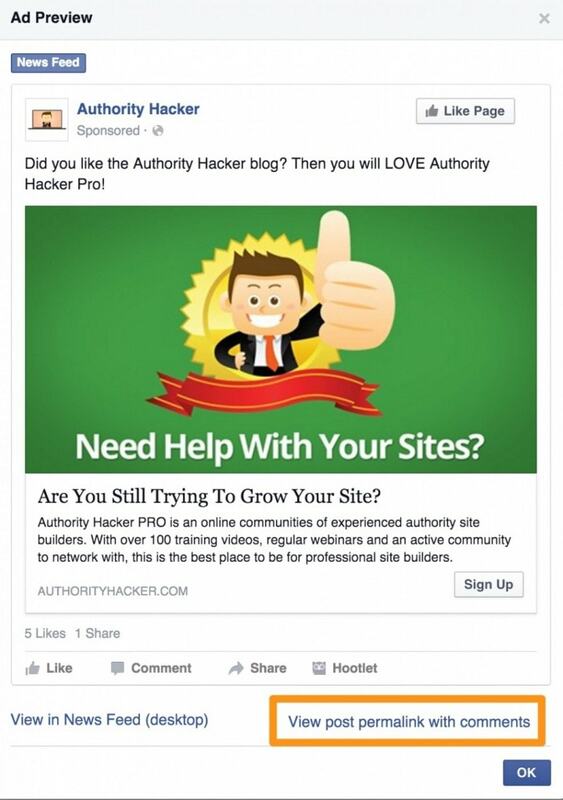 It is also well known that using FB fan posts to send organic traffic to an adsense monetized site just don’t work. In average you get CTR of 0.1-0.15% on organic fan posts and that takes to the site in which if you get a CTR of 1% (which is high) you need lots of millions of visitors coming to your FB fan page for that strategy to make sense. While I can understand the Skepticism, I doubt Jon would spend 95% of his time running those niche sites instead of Fat Stacks if they were not profitable. I just think it’s not as easy as putting content up and having an ad pointing to it. It’s also limited to some niches. You bring up a great point about Adsense revenue from Facebook traffic. Interestingly Facebook traffic generates the highest display ad RPM of any social media traffic and it’s quite a bit higher than search traffic. This explains why, when Facebook posts had decent reach soooooo many website publishers were sending so much traffic to their site; the revenue was really, really high. You also bring up another great point about the “guru”. Gael is right that I spend 95% of my time on my real niche sites. I wish I had more time for Fat Stacks, but I really blog there when I have something new to say. That may change down the road, but it’s been that way for 2 years. As for arbitrage, that doesn’t work in every niche, unless you have very good copywriting abilities and even then you must be in a niche where AdSense revenue will be respectable. I got a lot of value from this article. I too REALLY love display ads. Just need a lot of traffic to make a lot of money. Anyway my question is what are your CTR like? I don’t monetize my ad placements like you do, but I will be testing it soon.. But I get CTR of just under 1 percent to 2 percent on average days. I’m wondering if this is reasonable. John Dykstra spend huge money of buying traffic, buying social media traffic….. But, social media traffic, will not convert with adsense or any other media ads. Every marketer know this. Why on Hell John spends here a lot of money- when this traffic will not convert with adsense? One sentence he wrote; write 1 or 2 newsletters a week……bla bla bla…so that’s are 10 newsletters in a month…. (no- that will be 4-8 newsletters in a month- not 10) and many of such swirls you will find there. Promote your content on Facebook, ist’s cheap, spend $500 on every post on facebook- and such things…..
John- at the beginning of your entrepreneurship- you had this amount of capital you spend on buying traffic? Where is the capital come from- Bank credit? Or any other sources…..???? That is the big point I miss on this fat stack method. Yes it is open minded, but this method will not work for the affiliate start up, who not has this amount of capital. I miss a break down line on this method, such like “How can I do this with $100 capital who I can spend every month? With $100 capital in month, you can not pay much on an high quality content writer, who writes 2000 word posts every day for you- so the $100 capital is burned in one week, to pay a good writer. Then after you have no money there to buy paid traffic. This point I miss there. How can I do this method with $100 capital spend every month? At first when the media published extensively on this matter it was a concern and it will no doubt impact display ad revenues to some extent. It already has especially with some demographics that are prone to use ad blockers. However, given there are no real alternatives for monetizing many websites other than display ads, I think the most popular websites in the world will simply block people who use ad blockers. I know the website publishing pundits advise against this strategy currently, but when push comes to shove the biggest websites will likely block people from visiting which will force users to turn ad blockers off once blocking visitors is widespread. It’s already happening and as a few huge websites do this, many will follow. This is not a 100% solution, but I think that’s what will happen. I’ve spoken to ad networks I work with and they don’t seem particularly concerned. I’ve spoken to other publishers who also don’t seem terribly concerned. I don’t think we should ignore the issue but I’m definitely prepared to block visitors who use ad blockers if it’s a common practice with leading websites. The more publishers who join in blocking people with ad blockers, the more successful the strategy will be. Yes, websites can get white listed with ad blockers, but that’s akin to handing revenue control to an ad blocker which is not cool and will hurt revenue since the ad restrictions are nuts in order to get white listed. That said, I do recommend diversifying revenue streams. I’m doing a huge push into increasing affiliate revenue. I’ve read many huge publishers are working on more affiliate and sponsored post revenue. This is definitely something you want to do, but I don’t think it can fully replace display ad revenue. Thanks for all of your hard work on this articles guys. I actually purchased your Niche Tycoon book Jon, it’s brilliant – thanks. I do have one question, linked to something that’s been asked above. Google specifically states in the Adsense TOS that you may not use PPC to drive traffic to sites using Adsense. Clearly this hasn’t been a problem for you, but I wondered if you were ever concerned about this? Is this risky or is it one of those “over the top” Google policies which doesn’t get followed up? I think the limitation is on Adwords, not PPC in general. Since Jon uses Facebook ads I think he is clear. Hope that helps! Gael is correct. I use Facebook ad mostly and to some extent, Outbrain. However, I spoke with Adwords (I use Adwords for my local marketing work) and they gave me the green light to use Adwords to my display ad monetized sites. I was surprised by that. I told them my primary source of income was AdSense/Ad Exchange yet they said I could use Adwords. I haven’t taken them up on it yet, but I may down the road. That said, if you do use Adwords, talk to them first and get a copy of the live chat transcript if they give you the green light. Great information Jon. I will try to implement your techniques on my websites as well. I haven’t thought that Media.net and AdSense can generate this much. I have a website with over 500K monthly pageviews but its Adsense income is only $400/month. Can I get a tip on how to improve my income? You may be in a poor niche for ads. Not all niches perform the same. Other than that, ad placement is important. You must test placement extensively. Some ad networks work better than others in certain niches. For example, while Media.net does great in one niche for me, it earns only pennies on another niche site I own with decent traffic. You must try many ads, placements etc. Unfortunately, some niches just don’t work well with ads. If this is the case for you, consider other monetization options such as affiliate marketing and/or CPA offers. Sorry for the delayed response. Yes, I buy traffic to niche sites. Mostly with Facebook ads. I do less now than in the past just because I’m focusing on organic search now that I have some awesome authority, but buying traffic sure helped a lot in the beginning. With the help of Authority Hacker’s premium materials, I’m working really hard on actually creating a profitable email newsletter in my niche as well. This is something that I’ve struggled with for 2 years. If this works, it will be a game-changer for the niche site and no doubt other niche sites I launch/buy down the road. Amazing article, I have bookmarked it for later reference. Appreciate your information and time!! This is the best piece of content I’ve found on this subject. Thank you for the information. Do the polls/quizzes come from Criteo or Outbrain? Or do you use something else for the polls/quizzes and place an ad from Criteo/Outbrain ads after them? The polls/quizzes are with Opinion Stage. I like that service, but there are loads of options. Opinion Stage offers in-poll ads, which includes Criteo and Outbrain. I also use Criteo directly. It’s a great ad network. A question for Gael: which app have you used to display the optin box at the end of the article (just before “Gael’s conclusion”) with such beautiful animations? We use Thrive Leads ;). Im definitely looking into building more revenue with ad placement and the images you provided here a great! Glad you enjoyed it RJ! Hi Gael and Jon, where you buy your content? and how much you willing to pay them? Currently I’m struggling with that, need cheap content but high quality. Just know that you get what you pay for usually. We use Textbroker and hire writers on Upwork / Problogger and pay $40-50 per article. I know Jon uses Longerdays, check them out. Yeah, I use LongerDays for my biggest B2C site. They have in-house writers who are very good but they also manage everything. My B2C have a lot of moving parts including a lot of outreach and LD is able to do everything from start to finish. On my new site, it’s a different story. I hire beginning journalists. Since I’ve been able to pay for content in an industry that doesn’t typically pay for content, I’ve been able to get some good writing for very reasonable rates. It really depends on your niche. For instance, if I need law articles written, I’d place an ad at a law school for articles. I have a site that was getting around 400k visits per month but the adsense monetisation was a measly few hundred dollars. It also ate into the user experience. The ROI on promoting affiliate programs was astronomically higher (50+ times). So I dropped it and didn’t look back. At that time there was no such display ad automatic optimisation like ezoic, and on top of that, the site was built from bottom up using html. Your post certainly opened my eyes to the earning potential of display ads. My only concern in using display ads in the early life of a website is it potentially detract others from linking to the site/post. If you’re doing that well with affiliate promotion I doubt ad testing will result in beating affiliate revenue. Of course test it. However, maybe there are some pages on your site that would don’t sell affiliate products and so the best way to monetize is with display ads. If I were you, I’d keep promoting whatever you’re promoting that sells. Sounds like you have a good thing going on. Awesome article! I will definitely be using this system! Random question: Why does your Health Ambition site say that Helen Sanders is the founder? I don’t spend much time looking at revenue CPC for keywords. That said, when researching a niche generally I’ll take a look to ensure there’s some money to be made… but I’ve only found one niche I considered where the ad CPC was pretty low. However, I may still go into that niche because the search volume is insanely high and the competition isn’t too bad. You kind of have to look at all the factors and make a decision. Reddit traffic: I’m not surprised you earned pretty much nothing. I’ve had Reddit spikes and the revenue is non-existent. Don’t worry about it. Same thing with StumbleUpon. Generally those audiences do not click ads and/or have ad blockers. Device: Desktop earns me far more per 1,000 page views than mobile. I think that’s the case with most sites. Mobile is tricky and that publishing world is scrambling to figure out how to monetize mobile more. The problem is the percent of mobile traffic is increasing so let’s hope some good solutions come out. If getting a high RPM was easy, everyone would do this (not to mention traffic and all the rest that goes into it). Each niche is unique and it will take a lot of ad testing, affiliate testing and/or email marketing testing to get higher RPM levels. The longer you work within in the niche and the bigger your site grows, the more you’ll figure out how to monetize and more monetization opportunities will come knocking on your door. what a great article, most certainly will try some of this stuff out. @Gael: One question though. When I click the x other like this link, I do get a window, but there is no invite button showing. Is there something I need to install first? Nope, to my knowledge it should be that way on ads. Amazing article! One question Jon, and I´ve wondered this for a long time as a reader of your site: what about CPC? Before, almost every Adsense guide told us that one key factor for kw research was CPC or some other form of commercial intent. You´ve written about viral content in the past tailored for social media, especially list posts with tons of images, but this type of articles have zero commercial intent, and usually won´t target any commercial kw (also social media users are not in buying mood, especially when consuming this type of content). I experienced something similar some months ago when someone shared an article of mine on a popular sub-reddit, which gave me 15k visits in 2 days (extraordinary for my site). The earnings? Whopping 15 bucks at a $1 RPM (3 Adsense ad units, two in-content, one Skyscraper on the sidebar). The subject of the article had zero commercial intent and the kw zero CPC, and regarding the effectiveness of retargeting ads, something mentioned by many Adsense specialists… well, I don´t see that they´ve worked very well for me. I do see though, that in your example graph the traffic that gives you $12 RPM for display advertising comes from US desktop traffic (I assume targeted that way via paid traffic), while 50% + of my traffic comes from mobile, and I don´t have as many ad units as you, nore the in-content affiliate links or monetized emails. Still, getting from $1-2 RPM to $47 seems like a daunting task for me. I’m surprised Media.net isn’t available to you. That’s too bad. Media.net is a unique display ad which is why it works great in addition to the usual display ad networks. Other options include Taboola and/or video ads. I’m just starting to test some video ads. I’m told they can earn well, but it’s too early for me to confirm that. I think I’d play around with Taboola ads and video ads as secondary ad options on your site. I launched a site using a similar model in January. Already bough your guides, some great actionable info there. One question. I am in Australia and media.net is out of reach here. What would you recommend to replace it? Is Chitika good enough? Once any campaign runs out of steam, and they all do, I pause it and move on. I don’t try to fix it. But, it may be worth trying to fix it – I’ve just never done that. If I were to make changes, I think an image swap would be the best thing to change. Thanks for putting up a great article. This is an interesting idea worth investigating. I do have a question about Facebook advertising. Let’s say you do Facebook paid advertising on a post and its a winner for a few months. Then it’s not profitable anymore. Do you make adjustments to this campaign or just move onto another post? If you do make changes, what adjustments do you make to the campaign? Can you please talk more about the Google matched ad? Is it performing well? Can it outperform Taboola? The Google Matched ads aren’t huge earners by themselves, but Google says you can place a regular display unit above OR below a Matched Unit (https://support.google.com/adsense/answer/6111393). Those display ads above or below can do very well. I figures since the Matched Ads don’t count as one of your 3 display ad units, why not use them? As for whether they’re better than Taboola, I can’t say. I don’t use Taboola much for revenue because they don’t perform all that great in my niche. All I can say is test it. Excellent post! Gonna have to read this several times over just to digest it all. Just wondering… Say I have a website in the gifts niche. Any suggestion on how I can build an email list to get return visitors? It really depends what people are here for. If they are here for christmas gift, offer people a list of gifts that they can offer to people they don’t really know or the top 10 trending toys for kids this christmas. If they come for valentine’s days gifts then offer a list of 10 surprising gifts under $25. Basically, identify the intent of the page and offer something that matches that intent in exchange for an email. Then email regular discounts etc to your list ;). You got me thinking now! Maybe a an exit popup with a gift card giveaway for subscribers or something along those lines. even better, an on page load pop up ;) check that post to see what I mean. I’m going to defer to Gael on this one because he makes email marketing work much better with his authority sites than I do. Email marketing isn’t a focus for me… yet. FB ad targeting will vary tremendously by niche. It’s not one-size fits all unfortunately. Main keywords often are big interest groups. Facebook will often auto-suggest more. Magazines in your niche: These are often huge interest groups that are very relevant. I target many magazines. Other media: TV, movies, authors, books – all of these can be excellent interest groups. Other large websites: You can target fans of other large websites in your niche. I do this routinely. With respect to age ranges, gender and location – that boils down to testing. You probably have a decent idea when you start, but you’ll hone this over time. It takes testing. I got pretty lucky with my FB ad campaigns in the beginning, but then this was my second niche focusing on FB so I was very familiar with FB ads and targeting. I know my niche would do well and I knew who my audience was. I spent weeks researching my niche and dozens of other sites in the niche before launching (including carefully analyzing their FB and Pinterest channels). I tested 30 to 40 blog posts in the first 3 months. It didn’t take long to figure out which ones did best. Same thing with interest groups, age ranges, gender, etc. IMPORTANT TIP: I create a new adset for every interest group, device (desktop vs. mobile) and location. This way I can see which configuration works best and I can adjust budgets for each configuration. Also, not every niche will be profitable with direct ad traffic. In some cases, as I’m learning now in another niche site I own, it’s turning out to be more profitable to invest in fan acquisition and then use the page’s Newsfeed to send visitors to the site (over and over and over). Be prepared to experiment a lot. As a follower of Niche Pursuits, Authority Hacker, and Jon’s Fat Stacks Blog, how cool to see all the guys together here. Absolute gold in this post – thanks so much. Thanks Kimberly. It’s great getting to publish on AuthorityHacker. You´re very open about everything you do, but there´s one thing you don´t talk often: FB Ad targetting. Getting the targeting right is the real key to success, but it can be very difficult since there are so many variables (audience, image, title, niche, bidding competitors). Can you say something about how you launched your first campaigns when you started? How many interests and blogposts did you test the first month? And do you have any targetting tips for first-time ad buyers or pitfalls to avoid? Thanks for you great feedback. I’m glad you found it helpful even if you operate a different business model. I often get good ideas from different models. Thanks for leaving a comment. This blog post is easily better than 95% of WSOs I’ve come across. Even though it’s not my business model, there’s a crapton to learn in this post just in terms of strategy and authority building. Thanks Jon and Gael! One of the best articles I’ve ever read, Thank you for contributing this article to the Authority Hacker community. This has helped me so so so much! I’m at the beginning stages of building a network with a similar business model. There’s very little information out there on building a business like this. One of the key things that stood out for me one is the realistic timelines you provide and understanding how this correlates with paid acquisition. One question I do have is how big is your current team and how has it grown since the beginning? I’m glad you like the article. Gael and Perrin did a super job editing it, dressing it up with screenshots and making it read better. For my largest B2C site, I have 4 to 8 people working on it at any given time. It fluctuates when I hire people for one-off projects. My current core crew is 6 people. For another B2C site, there are dozens of people involved. It’s a different type of site… a passion site within the niche so many people contribute. We offer remuneration for content but many people also contribute for free. There are editors and an editor-in-chief who also get paid. It’s a great site because the level of expertise in the content is second-to-none. I should add, when I started my most successful B2C site, I did everything myself. I spent 30 days writing seed-content. I then published it and continued publishing my own content while experimenting with FB ads, FB posts, Pinterest, email marketing, more content, etc. The point is you can start without an outsourcing budget. I only ever invested in outsourcing with profits. That said, I’m now fortunate to expand into more sites using profits from existing sites to grow them faster. The point is I didn’t borrow or use much of my own money to start. It was a shoestring operation until it generated revenue. My up front costs were $5 hosting and a low-cost stock image subscription and one premium WordPress theme. Total investment in the first 3 months was probably a few hundred dollars. Thanks a lot Gael and Perrin. Looks great. Thanks a ton for inviting me to guest post on your site. You’re welcome Jon, thanks for sharing!